There is something magical about creating a place or a world that previously only existed inside your own head. It’s impossible to draw (at least it is for me) an imaginary landscape without wondering about the people who inhabit it, or the history of it, or the flora and fauna that fill it. Some of my landscapes are very much rooted in the real world, the lake district is never far from the tip of my pen, while some have only the loosest foundations here on earth. 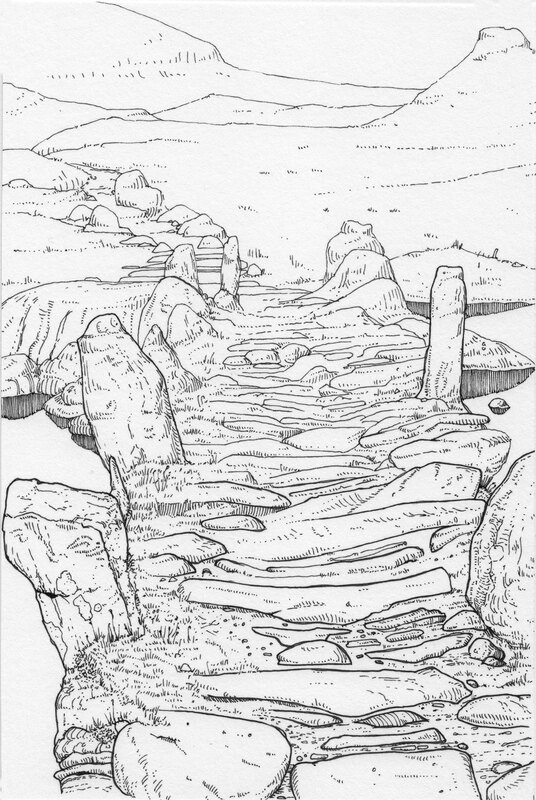 Only one of my landscapes exists as is, Slater’s Bridge in Little Langdale in the Lake District. I really must get back there with a sketchbook. It’s an amazingly beautiful place. People are very rare in my drawings, partly because I’m pretty terrible at drawing them, but partly because I want to be the person in the picture. I don’t want to share these places with anyone else. Extreme escapism for me would be stepping into one of my illustrations and exploring what’s beyond the edge of the page. What wonderful illustrations! You are very talented! This is superb. I would love you to illustrate something I’ve written. Thank you very much. I hadn’t really drawn for twenty years when I decided to start this blog, pretty much with the idea of making me draw more often. It’s a good routine to get in to – drawing every day. You’d be surprised how quickly you can improve. Keep drawing. Well, feel free to email me something, or to tweet something at me. I can’t guarantee I’ll be able to, I’m pretty busy at the moment, but if I can find time it could be fun. Amazing, every time I get into you blog, I found a new place. Always unexpected always unforeseen, but stunning. Really nice composition! Nice pen work. Well done.